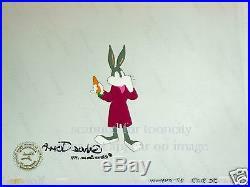 Hand Signed Production Cel of Bugs Bunny from Warner Bros. "The Bugs Bunny/Road-Runner Movie" (1979). 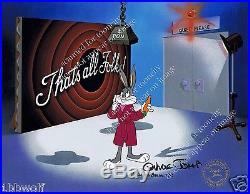 A great image of Bugs Bunny in his Movie Star like Robe, with a carrot in his hand. VERY, VERY hard to find productions cels with Bugs and a Carrot. This hand Painted Production cel is a One-of-a kind piece. Production cels are images that are actually photograph for a film or short. One can actually freeze-frame the DVD on the exact image. Hand Signed by Chuck Jones. 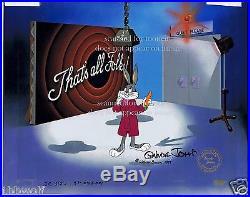 Cel size is 12.5 x 10.5 inches, with the character Bugs Bunny is centered and measuring 5.5 x 3 inches in size. Production codes inked along the bottom of the cel. Cel is 3 punch animation cel. Bugs spots the 1 ton anvil hanging above his head, by pointing at it. 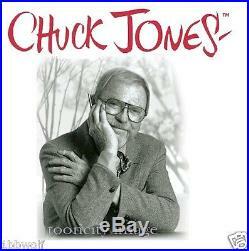 Strong, Bold Signature of Animation legend, Chuck Jones. That's right, this cel is hand signed by Chuck Jones. The answer will always be NO. 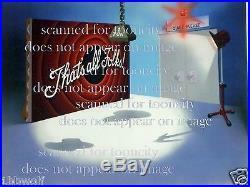 Image feature the background set of the a Looney Tunes cartoon "That's All Folks" backdrop. Studio lights and a 1 ton Anvil hanging above Bugs' head. Must be Daffy pulling a trick. Background is 11x14 inches in size. Includes: The LINDA JONES ENTERPRISES Seal Embossed onto the cel. Charles Martin "Chuck" Jones (September 21, 1912 February 22, 2002) was an American animator, cartoon artist, screenwriter, producer, and director of animated films, most memorably of Looney Tunes and Merrie Melodies shorts for the Warner Brothers cartoon studio. He directed many of the classic short animated cartoons starring Bugs Bunny, Daffy Duck, the Road Runner & Wile E.
Coyote, Pepé Le Pew and the other Warners characters, including the memorable What's Opera, Doc? (1957), Duck Amuck (1952) (both later inducted into the National Film Registry) and The Jones' famous "Hunter's Trilogy" of Rabbit Fire, Rabbit Seasoning, and Duck! (19511953), establishing himself as an important innovator and storyteller. Jones, like the rest of his Termite Terrace associates after the departure of Schlesinger, has been criticized for using repetitive plots, most obvious in the Pepé Le Pew and Road Runner cartoons. It must be noted, however, that many of these films were originally issued to theaters years apart, and the repetitious factor was often done at the request of the producers, management, or theater owners. Also, series like the Road Runner were set up as exercises in exploring the same situation in different ways. Jones had a set list of rules as to what could and could not occur in a Road Runner cartoon, and stated that it was not what happened that was important in the films, but how it happened. Chuck Jones' reinvention of certain characters is also a controversial subject. He re-imagined the wacky, Clampett-esque hero Daffy Duck as a greedy, sneaky antagonist with a slow-burning temper; and he relegated hapless star Porky Pig to being a sidekick or audience-aware observer of the action. Jones also created a series of films in which he used Friz Freleng's Sylvester in the context of a real cat. Like all the Warner's directors, his Bugs Bunny characterization is unique to his films: Jones' Bugs never attacks unless attacked, unlike Avery's and Clampett's bombastic rabbits. 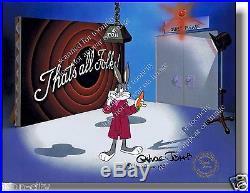 The item "Bugs Bunny Movie cel signed Chuck Jones Warner Bros EXCLUSIVE Background" is in sale since Sunday, September 16, 2018. This item is in the category "Collectibles\Animation Art & Characters\Animation Art\Sericels". The seller is "toon-city" and is located in Escondido, California. This item can be shipped to United States, Canada, United Kingdom, Denmark, Romania, Slovakia, Bulgaria, Czech republic, Finland, Hungary, Latvia, Lithuania, Malta, Estonia, Australia, Greece, Portugal, Cyprus, Slovenia, Japan, China, Sweden, South Korea, Indonesia, Taiwan, South africa, Thailand, Belgium, France, Hong Kong, Ireland, Netherlands, Poland, Spain, Italy, Germany, Austria, Israel, Mexico, New Zealand, Singapore, Switzerland, Norway, Saudi arabia, United arab emirates, Qatar, Kuwait, Bahrain, Croatia, Malaysia, Brazil, Chile, Colombia, Costa rica, Panama, Trinidad and tobago, Guatemala, Honduras, Jamaica.